Cybi was born in the late 5th century, the son of a Cornish nobleman, Selyf ap Geraint ap Erbin. His mother is reputed to have been a sister of St Non, which would make Cybi a cousin of St David. He was raised a Christian and is said to have visited Rome and Jerusalem as a young man. On his way home he was ordained priest by the Bishop of Poitiers. He renounced his inheritance on his father’s death and began to travel in the Celtic world. He founded churches in Brittany and Cornwall before crossing to South-East Wales with several followers. Churches were established at Llangybi-ar-Wysg and Llanddyfrwyr-yn-Ediligion in Gwent. From there Cybi may have travelled to Ireland before returning to Wales. Dedications at Llangybi (near Lampeter) and Llangybi (near Pwllheli) would suggest that he may have resided in these places for some time. Given land by King Maelgwn of Gwynedd, Cybi established a monastery at Caer Gybi (Holyhead) on Ynys Gybi (Holy Island) in Anglesey. He became a friend of St Seiriol who also had a monastic settlement on the opposite side of Anglesey. It is said that Cybi attended the Synod at Llandewi Brefi in 545 and later retired to live on Ynys Enlli (Bardsey Island) where he died about 555 and was buried there among the 20,000 saints though some claim he was buried at Capel y Bedd adjoining his monastery. 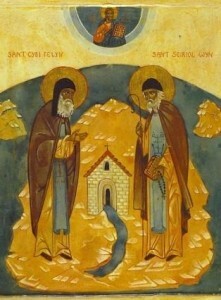 The Orthodox Church at Lampeter hold an annual Artoklasia at the Well of St Cybi in November. By your journeyings, O Hierarch Cybi, you teach us the virtue of making pilgrimages. Wherefore, O Prince of Ascetics and All-praised Wonderworker, we entreat you to intercede for us that Christ our God will not find our lives to be utterly worthless and will show us great mercy.